After deleting / changing the default you can then create custom partitions as recommended. / ext3 5.0GB The / (or “root”) partition stores the ESX system and all files not stored in another custom partition. If this partition is filled to capacity, the ESX host could crash. It is imperative to prevent this. swap 1600MB The swap partition is used to supplement RAM if the service console runs out of physical memory. /home ext3 512MB The /home partition is created as a failsafe to help prevent / from filling up. Service console accounts (not vCenter) each have an associated /home folder. As a best practice, administrators should not use these folders for storage. 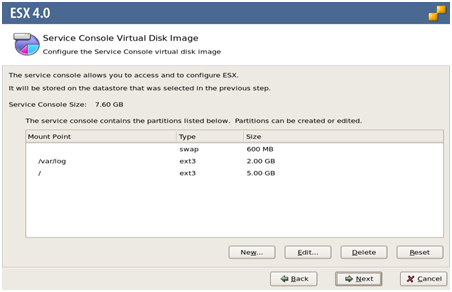 If service console accounts are to be used and there are multiple users requiring access, the size of this partition may need to be increased. By default, /home is part of the / partition. By creating a custom partition for it the / partition will be protected if /home fills to capacity. /tmp ext3 2.0GB The /tmp partition is also created as a failsafe to help prevent filling the / partition. /tmp is often used to untar support files, temporarily store copied logs and stage patches. By default, /tmp is part of the / partition. By creating a custom partition for it the / partition will be protected if /tmp fills to capacity. /vmimages ext3 512MB Traditionally, /vmimages was used to store CD-ROM images (.ISOs) and Floppy Disk images (.flp, .img). However, most organizations following best-practices have moved this from each individual host to a single shared-storage location. However, by default ESX creates a /vmimages folder within / . This makes it dangerously easy for an Administrator to mistake it for the shared-storage repository and copy images into it that will fill / . As a failsafe to help prevent this, a small custom /vmimages partition can be created. If the local /vmimages folder is actually used, this size may need to be increased. 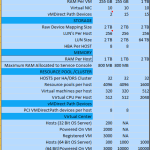 /var ext3 2.0GB The /var partition stores most system logs. 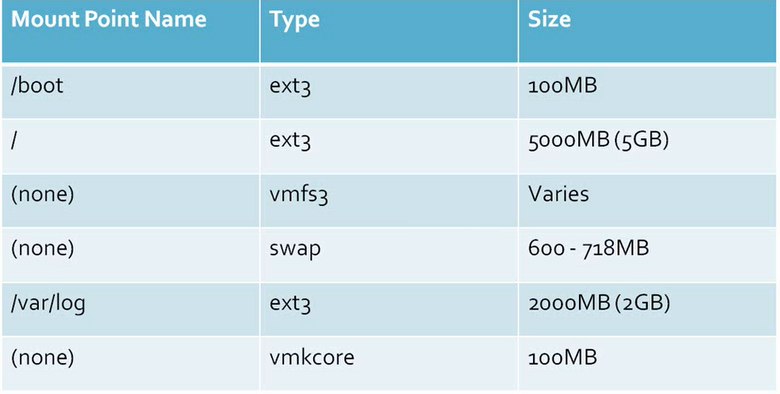 Creating a custom /var partition provides substantial, dedicated log storage space (/var/log) while protecting the / partition from being filled by log files. Normally /var is part of the / partition. /boot ext3 260MB /boot stores the files necessary to boot the service console. vmkcore 100MB The vmkcore partition temporarily stores log and error information should the VMkernel crash.